Last summer I repotted several cymbidium orchids. “Orchid” likely conjures up the loveliest of flowers, something too delicate to mess with, but the cymbidiums needed a firm hand. Over time they had migrated to the edge of their pots, as though trying to glacially ooze their way out and back to the wild. A ring of healthy lance-like leaves stood sentinel at the edge of the terracotta, and in the center was a mass of bloomed-out remnants, a cluster of moldering knobs in various forms of decay. Some of the knobs, when I picked away at them, revealed the subtlest hint of white material—promise that they might sprout again. I turned each pot on its side, tucked it between my knees, and pulled until the mass of roots slid out along with the fir bark chips they’d been nestled in. I laid the plant across the greenhouse floor, took a small pruning saw and made an incision down the center of the plant, stuck my fingers in, and pried it open. Then I made smaller incisions with the saw, grinding away the decayed material, and when the cuts became too small for the saw, I took a pair of pruners and snipped until I was left with just a small pile of fresh, promising shoots. If all went well, by winter, the larger sprouts would shoot out racemes loaded with butter-colored flowers. The inner petals would have magenta freckles, and a central petal—a labellum—would protrude tongue-like, almost rudely, with a small hood cupped over the top. Two yellow pollen bumps rest on top of the labellum, ridged just the right way to capture pollen off the legs of an insect going in. Cymbidiums flower for weeks on end, each plant maybe having five to ten racemes, each raceme over a foot tall and holding dozens of the mesmerizingly asymmetrical blossoms. Cymbidium comes from the Greek, kumbe, cup, the flowers being filled with the slightest drop of nectar that keeps bees nuzzling after it, like drunkards after the dregs of mead. “The King of Fragrance,” Confucius is said to have called them, although he may have meant they emit their fragrance for kings. The cymbidiums I have known are scentless. Our minds are quick to compare the flowers to female genitalia—yet “orchid” comes from the Greek órkhis, meaning testicle, because of the shape of the pseudobulbs, “pseudo” because this bulb doesn’t actually go underground, but lodges itself on surfaces above ground and functions more like a stem, the leaves of the orchid growing directly out of it. I’ve often wondered what it would be like to stumble upon a bunch of flowering cymbidiums in the wild, the way the naturalist Alexander von Humboldt saw them as he traveled through the tropical regions of South America at the turn of the 19th century. He observed them at a roaring cataract on his way to the Orinoco River, where the plunging torrents cast the area in a “perpetual verdure.” More than the flower, it’s the experience I’ve craved—to discover such beauty. Not to be the one here, trapped with such rote duties, but to be out in the world. The epiphytic orchids von Humboldt found grew up the trunks of giant fig trees along with begonias, vines, and vanilla orchids. A single trunk along the Atures Rapids on the Orinico, von Humboldt said, had more plants than an extensive plot of land in Europe. Recently, I did happen upon a field of flowers in the wild. It was the morning of a good friend’s wedding, and she wanted to pick the lupines for center arrangements. 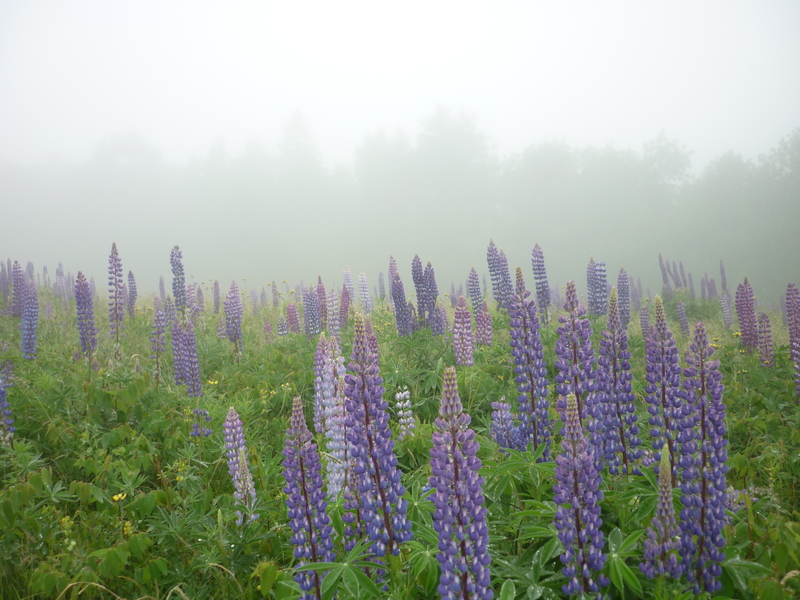 It was cold and misty, and the flowers grew wild by the hundreds of thousands in an open field at the base of Blue Hill Mountain in Maine. Through the coastal fog we waded through knee-high wet grass, and when we came upon the lupines, fields and fields of them, my heart leapt with excitement—so strange, so beautiful, as exotic as rare orchids. They were up to my waist, and each flower stalk was loaded with hundreds of small asymmetrical flowers, each like a tiny pouch, like a miniature snapdragon. The flower stalks came to a conical point, and at the top the flower buds were still closed tight, the flowers blooming from the bottom up. We were only supposed to pick enough—but I became greedy. I needed at least one that was a deep violet, one that was blue and white, one that was just white, one that was pink at the top fading to purple. I picked too many. We laid them in the trunks of our cars and brought them back; we arranged them in pottery vases that my friend had made, some bouquets so tall and resplendent that people took them off the tables during dinner so they could look across at people they hadn’t seen in years. At dinner I sat next to an old college friend, eight months pregnant, who had once worked as a landscape gardener but now ran a restaurant. “I loved the plants, but I hated working for the rich people,” she said as she picked at her dinner and rubbed her belly. The next morning the lupines drooped listlessly, their peppery fragrance like a fog in the room, one last desperate attempt to communicate with the outside world. The smell unfurling from its nestled position within the flowers was like a call out to all the pollinators. As we folded tables and collected champagne bottles and nursed our burgeoning hangovers, I felt mild regret at my own greediness, at our mistake of having too many lupines. But I also knew our bouquets hadn’t even made a dent in the field of wild flowers. And whereas I can never recreate that initial moment of seeing them for the first time, of watching their form slowly take shape through the fog, of startling at the realization of just how many there were, that’s the memory that sticks with me the most: the field of lupines. And I’ll always prefer them like that, in the ripe moment before I even realized my urge to pick them, before my hand had touched them, and the rain droplets still rested like a mosaic of perfect beads upon the leaves. The complete version of this essay can be read in the Spring 2014 issue of Fourth Genre.